Because you demanded it… Deadpool! The best predictor of a person’s reaction to the announcement of the Deadpool film may be their age. Above a certain age there’s a good chance the individual in question has never even heard of the character. Anyone younger than, say, 30, has a much better chance not just of knowing who Deadpool is, but of meeting the news with enthusiasm. It’s not only that Deadpool is a relatively recent character. Having premiered at the tail end of 1990 he’s a baby next to the likes of Spider-Man, Batman, and Superman. Deadpool also comes in for a great deal of criticism because of the era in which he was created. The 1990s linger in infamy in the minds of comic-book fans. As the era’s most famous survivor, Deadpool is seen as emblematic of the period. Deadpool first appeared in New Mutants #98, which hit stands in December of 1990. New Mutants holds the honor of being the very first X-Men spin-off. It would not, however, be the last. The problem was that by the time the calendar flipped over into the 1990s, New Mutants had come to be perceived as relatively staid in the context of a market fast filling with alternate versions of the X-Men concept. Where once Marvel had exercised admirable restraint in expanding the franchise, the end of the 1980s found the company bullish on expansion. By 1990 simply being the X-Men’s “B-Team” in a marketplace filled with multiple variations on the same concept wasn’t enough. It would be difficult to overestimate the influence, both positive and negative, that Rob Liefeld had on a generation of comic book creators and readers. Liefeld was immensely controversial from the moment he took over art duties on New Mutants in 1989. His style is polarizing, and his attitude repelled as many as it attracted. But most importantly, his comics sold in large quantities. To his fans, Liefeld’s art is energetic and propulsive, as direct a representation of the teenage id as exists in comics. His detractors see all the shortcuts—the wonky anatomy, nonexistent backgrounds, and an almost principled refusal to draw feet—as the work of a kid who should have never been allowed anywhere near the big leagues. The reality lies somewhere in between. Liefeld’s work is primitive, consciously and deliberately so. He takes shortcuts, but it’s in service of accentuating the parts of the story kids want to see: It’s the action, dummy. You will find no shortage of technical shortcomings in Liefeld’s work, but what his detractors often miss is the degree to which Liefeld’s work translated its creator’s enthusiasm, an enthusiasm in which his young fans saw themselves reflected. Not without reason did Liefeld later name his production studio Extreme. When fans refer pejoratively to “the ’90s” as an era, what they see in their mind’s eye is Liefeld, Levi’s 501 jeans commercial and all. Liefeld hit New Mutants with the strength of a freight train. Issue #87 hit stands in January of 1990, representing both the literal and figurative dawn of the 1990s. “Watch out muties! !” the cover exclaimed, “Her comes the man called—Cable! !” Despite his deathlessly non sequitur name, Cable was immensely and immediately popular. His arrival signaled the beginning of the end for the New Mutants as both a team and a concept, even though the book lingered for another year. Cable was a mystery man, a soldier-of-fortune with undefined connections to the mutant world, and a wanted man. Upon meeting the New Mutants he immediately took command of the team and began the process of turning a team of apprentice superheroes into a paramilitary attack squad. After a year’s worth of adventures with Cable, the New Mutants were dissolved and relaunched as X-Force. These events didn’t occur in a vacuum. At the same time that Liefeld was redefining the sleepy New Mutants, another artist named Jim Lee was having similar results on the line’s flagship Uncanny X-Men. The restraint Marvel had once exercised in regards to its X-Men line was long gone: The first issue of Liefeld’s X-Force sold 5 million copies, which set a new record as the bestselling comic of all time… for all of two months, before the first issue of Lee’s new adjective-less X-Men series hit two months later and sold 8 million copies. The ’90s had arrived. New Mutants ended with its 100th issue. The last three issues were devoted to cleaning house, writing off a few characters who weren’t going to be a part of X-Force as well as introducing a handful of new characters who would carry over to the new book, set to be drawn by Liefeld and scripted by Fabian Nicieza. The cover of New Mutants #98 introduces us not just to Deadpool but also “the mysterious Gideon” and “the dynamic Domino.” The less said about Gideon the better. Domino has fared slightly better, and still appears regularly as a supporting player in various X-Men titles. But despite the brevity of this first appearance, it was enough: fans wanted to see more of Deadpool. His popularity ensured him a recurring role as an antagonist in Liefeld’s X-Force. Deadpool began as an amoral, endlessly annoying mercenary whose competency was not always matched by his braggadocio. Although the character’s background, including origin, motivations, and even his name were still undefined, the rough outlines were present from the beginning. Liefeld surprised the industry by leaving X-Force before even a full year. Along with Lee and five other superstar artists, Liefeld left Marvel to start a new publishing company, Image. The formation of Image in 1992, however, contributed to the further stimulation of an already unhealthy marketplace. The following year saw the market flooded with a dreadful amount of product, much of it awful. But the speculators who had fueled the dramatic growth of the late ’80s had fled the scene by 1993, leaving retailers holding the bag. Fans who came of age reading Liefeld’s New Mutants and X-Force left the hobby in droves, and hundreds of stores closed in the immediate aftermath. Just because Liefeld left Marvel, however, does not mean that Deadpool languished. Deadpool earned his first miniseries in the summer of 1993—the heart of the storm for the market meltdown. Written by co-creator Nicieza and drawn by rising superstar Joe Madureira, the first four-issue Deadpool mini set the pattern for all subsequent appearances. Although Deadpool was still recognizably a bad guy, Nicieza used the opportunity to reveal that he was conflicted, with intimations of a tragic origin to explain his amoral nature as a consequence of past manipulation. He had friends, allies, and scruples—he was a mercenary, but it was clear that there were worse monsters. It’s not difficult to see why Marvel may have been wary of overextending the character, but his first solo outing remains a surprisingly sturdy action story. Nicieza’s first mini, and a follow-up written by Mark Waid the following year, established a rough template for Deadpool as a solo character: not yet a hero by any stretch, but certainly a feasible protagonist. By the middle of the decade he had a supporting cast, a small rogues’ gallery, and even an origin. Eventually, a legible backstory cohered. Deadpool is Wade Wilson, a mercenary who, after a successful career as an assassin and soldier of fortune, was diagnosed with terminal cancer. Desperate to survive, Wilson volunteered for an experimental procedure that held the promise of a cure. The good news for Wilson was that the procedure worked. The bad news is that Wilson had unwittingly fallen under the sway of the Weapon X program—the same secret organization responsible for painfully grafting the metal Adamantium onto Wolverine’s skeleton. Wilson was, in fact, given a derivate of Wolverine’s own healing factor (which is how, even though he possesses a mutant healing power, Deadpool is not actually a mutant himself—an important technicality). Notably, however, Deadpool’s healing factor is more powerful even than Wolverine’s, enabling him to recover from seemingly fatal wounds such as dismemberment and decapitation with relative swiftness. Eventually Wilson freed himself from Weapon X, but not before enduring unbelievable amounts of torture at the hands of sadistic scientists. Although his cancer was cured, he was left permanently scarred from head to toe as a result of these experiments, and his mind was furthermore fractured as a result of years of brainwashing. Left to his own devices, his moral compass was almost completely broken, but not without some small hope of recuperation. Although the first two miniseries were well received, it would be another two years before Deadpool received the call for an ongoing monthly title—strangely, partially due to events instigated by Liefeld. By 1996 the comics industry had still not recovered from the bloodbath of the early ’90s, and there was evidence that the worst was yet to come: Marvel would declare Chapter 11 bankruptcy in December of that year. Earlier that same year Marvel had signed a deal with two of the artists who had left the company in 1992—Liefeld and Jim Lee—to take over production of a group of Marvel’s underperforming core titles. Liefeld and Lee took over Fantastic Four, The Avengers, Captain America, and Iron Man, transforming them into Image comics in all but name. Although the books were widely panned, they sold well enough. The problem for Marvel was that, with four of their most eminent titles gone, they were left with a gaping hole in their publishing schedule. They filled this hole by rushing out new titles starring a swarm of backbenchers such as Ka-Zar, Alpha Flight, Heroes For Hire… and Deadpool. The first issue of Deadpool hit stands in November of 1996, almost six years removed from his premiere. 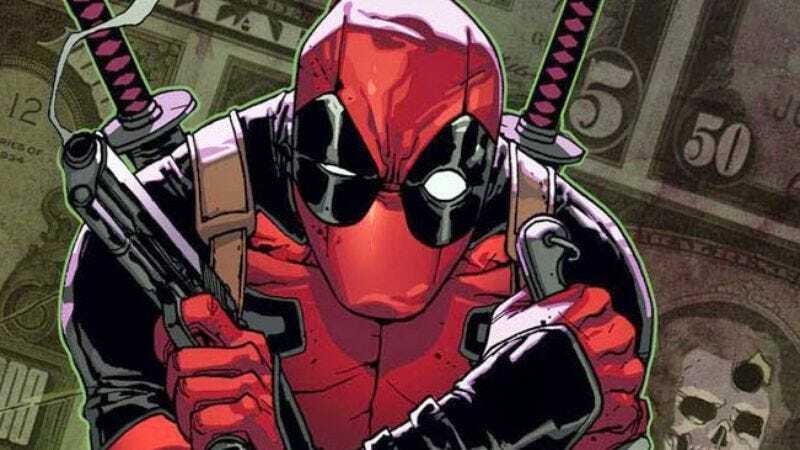 Although Deadpool was still a frequent guest star across the line, he was no longer “hot,” and any observer could have been forgiven for thinking that Marvel had waited a few years too long to capitalize on the popularity of an X-Force spin-off. What no one was expecting at the time was for Deadpool to actually be any good. The new series, launched by Joe Kelly and Ed McGuinness, quickly distinguished itself by standing out in a sea of less than stellar offerings released in the year of Marvel’s bankruptcy. Although Kelly was clearly walking in Nicieza and Waid’s footsteps, he soon established his own tone. His breakthrough on the title was the realization that the character could tolerate the kind of tonal whiplash that would sink other books: Deadpool was a cartoon character who used humor to cover up tragedy and sickness. The series established him as a kind of superheroic Bugs Bunny, indefatigably annoying and yet effective, with a preternatural knack for knowing how to manipulate the tropes of his own stories. An awareness of his own status as a fictional character enabled him to operate on multiple levels, as both a grim anti-hero and a conscious satire of the same. While Deadpool was not the first comic book superhero to possess meta-awareness of his own status as a comic book character, this ability had previously been the sole province of marginal characters such as DC’s Ambush Bug or Marvel’s own She-Hulk (particularly her early ’90s incarnation), whose books sold poorly and whose satirical appeal was largely “inside baseball.” Deadpool was a popular character whose success belied the conventional wisdom that funny characters didn’t sell. Deadpool had finally cracked the code that enabled him to transition to a leading man. He celebrated the end of his first year as a solo star with, arguably, his greatest single story, Deadpool #11’s “With Great Power Comes Great Coincidence.” The story features Deadpool traveling back in time to 1967’s Amazing Spider-Man #47, with Wade forced to take Peter Parker’s place, inserting his own dialogue and commentary into Stan Lee and John Romita’s original story. Much like Deadpool himself, it’s tacky and mean-spirited, with a cavalcade of cracks at the expense of Harry Osborn’s strange hair and Romita’s tendency to draw women as if they were in mid-leap while walking down the street. But it’s also funny, a knowing wink to long-time Marvel fans. It was proof that Deadpool had found a niche outside the realm of simply existing as another in a long line of X-Men spin-offs, and to this day every subsequent creator begins with Kelly’s version of Deadpool as more or less the default. Deadpool has been continuously published since 1996, give or take a few months in between volumes. After the initial heat of Kelly’s run, the character settled into a comfortable spot on the company’s midlist. For a few years during a relatively low-profile period in the mid-’00s he shared a title with fellow ’90s refugee Cable. Then, following a 2008 relaunch written by Daniel Way, the character experienced a sudden spike in popularity. The Way series didn’t present any kind of strikingly different interpretation but nevertheless hit a chord with fans that has yet to die down. Although his relative popularity has waxed and waned since 2008, he’s consistently been one of Marvel’s best selling titles. What’s more, Deadpool sells phenomenally well in collected form: The character’s backlist outsells that of every other Marvel character by a wide margin, with only newly-minted superstar Ms. Marvel coming anywhere close. The character’s signature tacky humor acts as a kind of insulation against accusations of overexposure. There’s no gimmick too awful or cheesy that it seems out of character—and in any event, the comic buying audience’s thirst for new Deadpool product doesn’t appear to have an upper limit. The most remarkable thing about Deadpool’s popularity over the past decade, however, has been the character’s profile outside of comics. Although Ryan Reynolds played a character named Wade Wilson in 2009’s poorly received X-Men Origins: Wolverine film, the Deadpool who appeared in that film was a mindless and mute monster who bore little resemblance to the character as he appears in the comics. Fans were apoplectic. Although a possible Deadpool solo movie was teased to follow, the film’s poor reception placed the spin-off on hold. Development slowed until sometimes around 2012, at which time Fox quietly pulled the plug. So without a movie or a TV show to raise his profile, just how has Deadpool become so popular? There’s really no good answer other than that he’s built a fan base the “old fashioned” way: gradually, and by word of mouth. In 2013 Activision released a Deadpool video game for Playstation and X-Box—again, without benefit of any media tie-in. From where did the demand come? The character’s appeal is such that the very existence of his forthcoming movie is credited to fan enthusiasm. In July of 2014 a Deadpool effects reel from two years previous, featuring Reynolds in costume, “leaked” online. Fan reaction was overwhelming, and by September Fox had placed the film on the fast track, with a release date set for February 2016. Anticipation for Deadpool is high. There’s still resistance to the character among a certain strain of old-school comics fans, but those readers appear to be outnumbered. Fox has made the bold decision to allow the movie to go forward with an R rating, confirming that the character’s mega-violence will not be compromised. In the context of a market where superhero media of all types is micromanaged by multi-billion dollar conglomerates, Deadpool is a genuine anomaly. Deadpool can legitimately boast of being a product of popular demand: this movie literally wouldn’t exist if lots of people didn’t like him—really, really like him, as Sally Field might say. Whether or not the film will hit with an audience outside the character’s sizable cult remains to be seen, but given the long odds Deadpool has already overcome to get to this point, you’d be a fool to bet against him.